Having a website is vital for photographers to advertise their services, showcase their portfolio and harness the power of social media for online marketing. However, it’s surprising how many photographers don’t utilize their website to its fullest potential. Rather than just advertising your services online in the form of photo-shoot packages, it’s simpler than you might think to create a secondary income stream by selling digital images and prints directly from your website. Whether you want to sell digital or physical prints of your artistic images or sell licenses for more commercial images as stock photography, it’s easier than ever before to do so. If someone is browsing your gallery and sees a photo they like, why not give them the opportunity to buy that photograph right from your website? Selling photos online can offset the setup costs of your website and even become a lucrative side business over time. Selling photos through microstock websites has historically been the only option for photographers. If your application is approved, you’ll have the ability to upload photos to their library. A word of caution: Pay attention to the fine print. Many microstock websites take as much as 70% of each sale and give photographers a small cut of the sale, sometimes as little as 30% commission. Visual Society makes it easy to sell photos and prints online. If you plan to sell stock photos, Visual Society allows photographers keep 100% of the profit from all photo sales. This is radically better deal for photographers, who have historically had to forfeit 30% to 70% of each sale to their contracted microstock website. 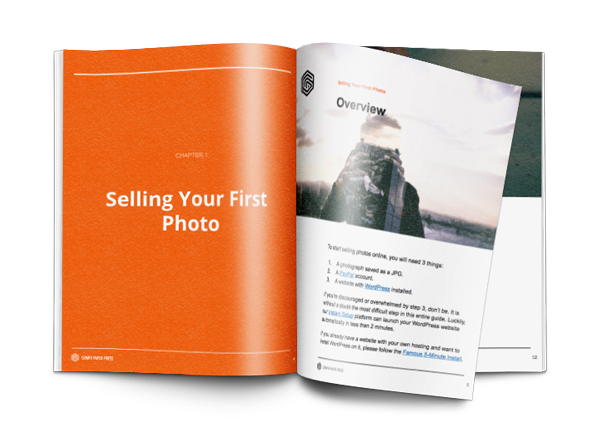 Now, photographers can set their own prices and build a niche photography business with ease. In addition to selling stock photos, Visual Society also makes it a breeze to sell prints on canvas, photo books, and even prints on merchandise (like mugs and phone cases). Go try it out, it’s free for 14 days. As the popularity of self-publishing (through blogs and e-books) has increased, the demand for stock photography has grown. A number of new microstock sites have sprung up to provide affordable images to designers, business owners, authors and bloggers, with the option to choose from different licenses for different uses. Stock photographs may be used in website designs, blog articles, posters, flyers, book jackets, company reports, newsletters and pretty much any other use you can think of. Because the demand for high quality, affordable stock photography is so high, it can generate a decent side income for any photographer with a large portfolio of stock images for sale. It’s wise to build up a collection of photographs that are likely to be profitable as stock photos. Have a look at the most downloaded images from stock sites and you’ll get an idea of what type of image is in the highest demand. Generic business images are always popular, as are simple symbolic photographs that can illustrate concepts and emotions. The easiest way to make your photographs available as stock images for sale is by using a third-party microstock website such as iStockPhoto, Dreamstime, Shutterstock, 123RF, or Getty Images via Flickr. Selling your photos through a stock agency like this is quick and easy. They do all the marketing for you and thousands of people search for images on these sites every day. While many photographers get started in selling stock photography by listing their images on a site like this, there are drawbacks to this approach. You’ll be paying a large commission on each sale for every image that you sell. These fees vary quite a lot between different sites and depending on the restrictions of the licenses you offer. Most sites offer between 20% and 60% royalty to the photographer per sale. The set price for stock images also varies widely between sites. Some sites sell images for a little as a dollar per image for low-res photographs, leaving you with pennies after the site has taken their commission. Other sites charge more for images but sell at lower volumes so it’s worth experimenting with a few different sites to see what suits you best. Another point to consider is that most stock image sites make it very easy for people to pick and choose images from many different photographers and won’t do much to help you to grow your brand. Ideally you want people browsing stock to choose from your portfolio before they start looking anywhere else. If Visual Society isn’t the right fit and you also don’t want to sell through a stock photography site, there is a third alternative. It’s also possible to sell stock images directly from your own independently hosted website. Just like Visual Society, selling photos from your own site can be very profitable once you build up a large collection. The Sell Media plugin enables you to sell images directly from your own independent WordPress website. Many photographers are put off the idea of selling images from their own website because they think it involves an expensive e-commerce site and complicated payment gateways. While this was true in the past, it’s now very easy to set up your own site to sell images. If your website is set up on WordPress you’re in luck, as there’s a large selection of plugins and themes designed specifically for selling stock images. A plugin like Sell Media can be installed and setup easily, allowing you to start profiting from your images immediately. You can take online payments, protect your images with a password and watermark, and sell them with a variety of license options. You’ll need to consider pricing for your images carefully. To stay competitive with the big stock photography sites, you’ll probably want to price low but remember you’ll be getting 100% of each sale, rather than less than half. You can also maximize your earnings by selling images together in a bundle or collection based on a theme. It’s also worth considering making some of your images available for free on one of the free stock photography sites with a link back to your website. This will drive more traffic back to your site (where you can make more sales) and help to build your brand. As well as allowing you to sell your images as stock, the both Visual Society and the Sell Media plugin also offers you the option to sell photo prints through your website. This can be a nice option to offer clients, allowing them to browse images from a photo session in their own time and order as many prints as they choose. This not only makes it easier for clients to buy prints from their own photo sessions, but you also have the option to sell prints to website visitors looking for the perfect image for their home or office. The demand for physical art prints is not as high as that for digital licenses of photos but it could still be a nice sideline to your business, particularly if you specialize in landscapes or more artistic stylized photography. Have a browse through some interior design magazines and see what people are putting on their walls and if there’s anything similar in your collection. The main sticking point with selling prints is that it can be quite time consuming and expensive to print them yourself. If you keep a stock of prints on hand, you have to pay out of your own pocket up front and run the risk of them not selling. If you order them on demand it can take up a lot of your time and cost extra in shipping costs and packing supplies. Using a plugin for automating the process makes everything much simpler as the images can be sent directly to your preferred print vendor and shipped directly to the customer on demand without needing any intervention. The main challenge when you’re selling photographs (either digital licenses or prints) from your own site rather than through a stock library is to get people to find your site in the first place. With so many photographers jostling for attention and several behemoth stock photography sites, you can start to feel like a very small pebble on a very big beach. There are many ways that you can help people find their way towards your site, including but not limited to SEO and social media marketing. One of the best things you can do for your site – which can also drive traffic in many different forms – is start a blog. Blogs provide lots of keyword-relevant content, which search engines love, provide a way of engaging with your audience and encouraging social media shares, and are a great way to drop in references to your photos for sale. You can blog about your everyday life as a photographer, the business of photography or anything that allows you to showcase your images in an interesting way. Many readers will follow along because they enjoy reading your words and seeing your images but you’re also likely to attract a few potential buyers. You could have a website up and running complete with a fully automated online store for selling stock images or prints within minutes if you use Visual Society. Selling photos online is not only a great way to make some extra cash but also brings extra exposure for your brand and your business and could lead to bigger things further down the road. Creating your own photo-shoots for the purposes of creating stock images or art prints is also an excellent way to hone your photographic skills, experiment with styles and provide a welcome change from your normal client work. Visual Society – Easiest way to get started. Includes a free trial and customizable designs. Sell Media – A free WordPress plugin that you can install on your own WordPress website. Third-party Microstock Websites – Application required. High commission fees taken. If you’ve successfully set up your own website to sell photos we’d love to see it – please leave a link in the comments. This entry was posted in Blog, Featured, Photography and tagged sell media. Bookmark the permalink. Sell media plugin is a must, great read thank you. among the microstock websites that you mentioned – you forgot fotolia (www.fotolia.com) which performs much better than 123rf. Fotolia is one of the big 4, bought recently by Adobe. Thanks Tom. Unfortunately, all of the services you referenced take significant percentages from your sales. This was precisely why we created Sell Media. We think photographers should be able to keep 100% of their photo sales. Plus, our free Sell Media plugin works with any WordPress theme. Well, at iStock you don’t have to be over 18. Thank you so much for these words of wisdom. I read the Article very well. The way I see it, the first thing to do is to have a ‘Website.’ My question how do we create a Website. ? Can anyone be able to create one OR have first contact Web professional..! Secondly, is it free to create one..? Thanks for your help. 3. WordPress installed on your server. Download our free guide below if you need a more detailed explanation. Quick question- if I set up a store to sell my photos on my site (I’m a food blogger), can I also submit to stock photography sites to sell? I’m just trying to figure out what is/isn’t legal when it comes to selling photos. I’d like to get the photos I use on my blog out and available to others as a way to 1) gain traffic and 2) make some extra money. Any resources or help you could provide would be great! Hi! I love the article and the comments extremely helpful. I’m a street photographer and after reading this article I believe I have a clear path as to how to get started selling my photos. I was wondering if I should be concerned about legal issues when photographing street art such as murals etc. Thanks. I am a new blogger, and I was approached by scopio.io about licensing one of my videos. This is a first for me, so I was wondering if you have heard anything about this company. Thank you! Hi ! I’m paula from Colombia ! I’m not a professional photographer but photograph is my passion and I’m trying to figure it out how can I get some extra money with that ! I do believe I have a great collection of pictures but I’m not really sure about the quality because most of them were taking with my phone. What do you recommend me about the quality of the pictures ? Good suggestions, I have a question, how can photographers protect their photos stealing? Hi, I take photos of tourist surfers from the water in a specific area, in a different country than mine. It is pretty successful, and I just started getting serious about it. But I am afraid about legal issues limiting or even preventing me from selling photos there – I plan on being legal but am afraid it might be too complicated. Is it legal if I build a website where the foreign surfers can browse their photos and purchase them whenever/ wherever they feel? Thanks.. I absolutely love the sell media plugins by Graphpaperpress.com – it has made setting up Walkersnaps.com a Snap! my photo’s. At 86yrs I find it too difficult to set up my own Website. I need to have one set up for me just a modest one. What sort of cost would this be? I want to display & sell my pictures. Your articles are very interesting and very clear to understand. I use Squarespace for my web platform. I guess I am out of luck using the Sell Media plug-in right? Correct, you can’t do it through Squarespace. You can create a WordPress site, add our plugin, and run the site on a subdomain like store.graggphoto.com. That’s what most people do when they use different web platforms for different aspects of their websites. That said, this is why using WordPress is superior in my opinion: Squarespace is a pretty limited platform, good at creating basic websites. But when you want to build a real website and customize it, you’ll eventually have to use something like WordPress. You can do everything using WordPress that you do at Squarespace, plus a lot more. But you can’t do everything you can on Squarespace that you can using WordPress. This is why WordPress is the clear winner for people who need more than just a basic website. Does any one know of special plugins to sell one’s photos through a Squarespace based website? I currently have FineArtAmerica set up on my site by I do not like the format or the cut that’s taken from the sale. My website is chandlerwalkerphotography:com if anyone wants to see what I am referring to. Thanks. Great article! Has anyone else struggled with WordPress functionality? I persevered to get my website up (RodHarbinson.com) but it has been time consuming. Has anyone got recommendations for other platforms? Thanks for the great information.I love the article and the comments extremely helpful. I’m a Wedding Photographer in chennai and i had no clue how to sell mu photos, but you just cracked everything in this article. Thank you once again.